Despite being evacuated from their camp at the end of February, activists protesting the Dakota Access Pipeline have continued to raise significant amounts of money. 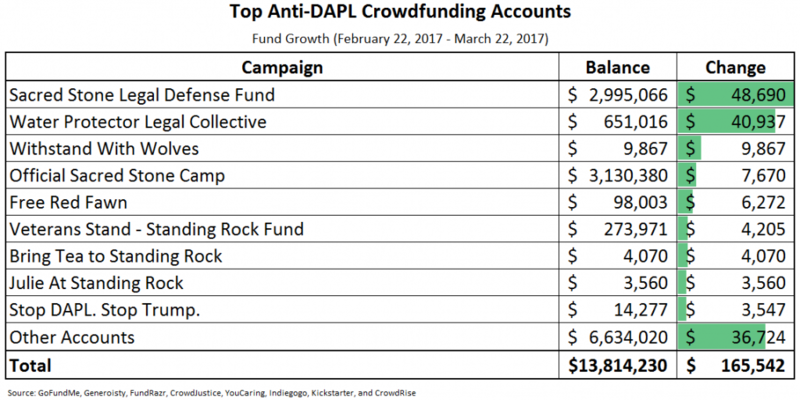 In the past month, protesters have received over $165,000 in new donations, according to a Standing Rock Fact Checker analysis of 410 crowdfunding accounts, which, as of March 22, totaled a whopping $13,814,230. Now that the months long protest is finally over it seems fair to ask why the protesters are still seeking more money and what is it being used for. We all know it’s not going towards reimbursing the taxpayers who shelled out $1.1 million to clean up the mess they left behind or the $35.8 million North Dakota has spent responding to countless acts of unruly behavior. Together, the “Sacred Stone Legal Defense Fund” and “Official Sacred Stone Camp” hauled in more than $56,000 despite the fact that the notorious protest camp was shut down March 1 by the Bureau of Indian Affairs. The camp’s founder, Ladonna Brave Bull Allard, maintains that her group is a registered nonprofit organization, but the absence of any evidence supporting this claim has led some to question whether the seven figure fundraisers are being used as a source of personal income. Another suspect campaign, the “Water Protector Legal Collective,” received upwards of $41,000 in March, placing its total earnings to date just over $650,000. The so called support group claims to provide legal services to protesters who have been arrested on charges ranging from criminal trespassing to attempted murder. While not making the top ten, another suspicious campaign dubbed “Siouxing the Black Snake” was started by the Cheyenne River Sioux Tribe on March 16 to raise money to support a twice failed legal bid to stop the pipeline. Donors have pledged a meager $600 thus far to the tribe’s $10,000 goal.